Looking for deals in Düsseldorf? Business Hotel Wieland is centrally located in Düsseldorf, just a 2-minute tram journey from the famous Königsallee shopping street. It offers its own beauty salon, free Wi-Fi and a breakfast room. The hotel is good, clean, the room confortable and the staff nice. This hotel in the Pempelfort district of Düsseldorf features free Wi-Fi, a spa area with a gym and saunas as well as a Mediterranean-style restaurant. Very good value, rooms comes with romantic lighting and a sterio supports iPhone. Very comfortable bed. Staff went out their way to help us booking tickets to adjacent cities. Nearby got two U-bahn station - convenient access to the city centre and the train station. This hotel in Düsseldorf is a 5-minute walk from the Volksgarten Park and Volksgarten S-Bahn Station. It offers nonsmoking rooms with special lighting, free wellness facilities, and a garden terrace. Excellent and exceptional breakfast!. Room is clean and staff are truly kind and very helpful. This hotel in the Pempelfort district of Düsseldorf offers convenient connections to the Old Town district and the main train station. That staff was very friendly and helpful. Breakfast was well presented and the food was excellent. This 3-star superior hotel in Dusseldorf has free Wi-Fi, underground parking and a free sauna. Clean, quiet, very modern, great staff, gOod beds, EXCELLENT BREAKFAST!! Highly recommended! Holiday Inn Düsseldorf City – Toulouser Allee offers accommodations in Düsseldorf. Free WiFi is provided. It offers air conditioned rooms. One bottle of water is provided free of charge in each room. The staff was young, friendly and diverse. All were extremely welcoming. me and all hotel düsseldorf is a boutique hotel located in the famous Japanese Quartrer in the center of Düsseldorf. Location. Cleanness. Facility. almost everything. Holiday Inn Express Dusseldorf City offers city center accommodations, 2953 feet from Düsseldorf Main Station. It offers an on-site bar, private parking and free WiFi. Very good value for money. The hotel is very clean and quiet. This luxurious hotel is located in Düsseldorf’s lively MedienHafen district, directly on the River Rhine. Parking, Nice Room, quit location, nice view, Modern and Nice Design , Fast check in and check out. Offering a stylish bar and a free spa, this 4-star-superior hotel is located next to Düsseldorf’s Hofgarten Park. It is a 15-minute walk from the Old Town and Königsallee shopping mile. Great hotel in a great location, only 10-15 minutes walk from the Adstadt area. McDreams Hotel Düsseldorf-City is located in Düsseldorf, within 2.3 mi of Capitol Theater Düsseldorf. Location is great. Free parking. Rooms are nice and clean. Friendly staff. Located in central Düsseldorf, 3-star Bellevue Hotel is a 7-minute walk away from the Düsseldorf main train station and a 10-minute walk away from Königsallee shopping street. Hot breakfast. It was pretty good in the area. This stylish hotel in Düsseldorf’s prestigious Derendorf district enjoys convenient access to the Königsallee shopping boulevard, exhibition grounds and airport. I left shortly after 4 a.m., so not breakfast was served. This hotel is located on the exclusive Königsallee shopping street in Düsseldorf. It offers a large health club, creative cuisine, and soundproofed rooms with elegant décor. Excellent service. Big Room. Location is the best. The Steigenberger Eck restaurant offers culinary classics, at this 5-star hotel in Düsseldorf, located on the elegant Königsallee shopping street. It is one of the most amazing hotels in the world. Very classy and the staff are caring and helpful. 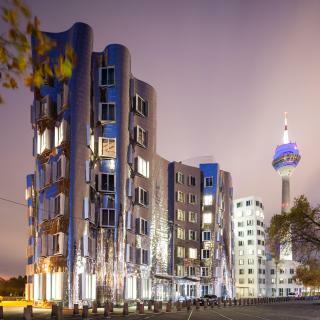 Located in Düsseldorf, 164 feet from Königsallee, The Fritz Düsseldorf features a Michelin-star restaurant, bar and free WiFi throughout the property. The rooms are equipped with a flat-screen TV. Fell in love with this hotel - small but extremely cool, cozy and lovely at the same time. This stylish hotel in the center of Düsseldorf Old Town lies just 197 feet from the Rhine Promenade. Hotel Orangerie features rental bikes, free Wi-Fi and a conservatory. Staff was very friendly and very helpful. Breakfast buffet was excellent. What are the best hotels in Düsseldorf near Düsseldorf Airport? Travelers who stayed in Düsseldorf near Düsseldorf Airport (DUS) have said good things about Sheraton Duesseldorf Airport Hotel, Maritim Hotel Düsseldorf, and Lindner Hotel Düsseldorf Airport. How much is a hotel in Düsseldorf for this weekend? The average price per night for a 3-star hotel in Düsseldorf this weekend is £131 or, for a 4-star hotel, £160. Looking for something even fancier? 5-star hotels in Düsseldorf for this weekend cost around £340 per night, on average (based on Booking.com prices). Which hotels in Düsseldorf have nice views? 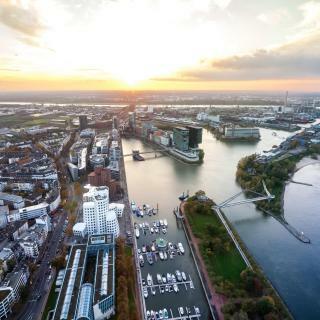 Hyatt Regency Düsseldorf, Van der Valk Airporthotel Düsseldorf, and VIVA RIVERSIDE 4+ Altstadt Düsseldorf got great room view-related reviews from travelers in Düsseldorf. How much does it cost to stay in a hotel in Düsseldorf? On average, 3-star hotels in Düsseldorf cost £63 per night, and 4-star hotels in Düsseldorf are £92 per night. If you're looking for something really special, a 5-star hotel in Düsseldorf can be found for £203 per night, on average (based on Booking.com prices). What are the best hotels in Düsseldorf near ISS Dome? 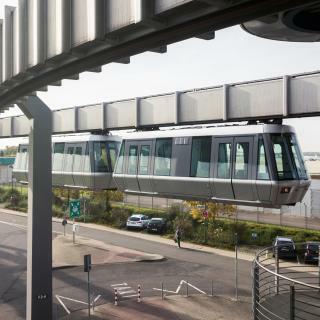 Some of the best hotels in Düsseldorf near ISS Dome include Van der Valk Airporthotel Düsseldorf, Airpartments Düsseldorf Airport / Trade Fair and B&B Hotel Düsseldorf-Airport. Which hotels are the best ones to stay at in Düsseldorf? Business Wieland Hotel, Hotel Indigo - Dusseldorf - Victoriaplatz, and Hotel Favor are some of the popular hotels in Düsseldorf. How much is a hotel in Düsseldorf for tonight? On average, it costs £67 per night to book a 3-star hotel in Düsseldorf for tonight. You'll pay around £94 if you choose to stay in a 4-star hotel tonight, while a 5-star hotel in Düsseldorf will cost around £212, on average (based on Booking.com prices). Which hotels in Düsseldorf are good for families? Many families visiting Düsseldorf loved staying at Henri Hotel Düsseldorf Downtown, Hotel Gut Moschenhof, and Capella Breidenbacher Hof Düsseldorf. Which hotels in Düsseldorf offer an especially good breakfast? For hotels in Düsseldorf that serve highly-rated breakfasts, try Hotel National Düsseldorf (Superior), Auszeit Hotel Düsseldorf - das Frühstückshotel - Partner of SORAT Hotels, and VIVA RIVERSIDE 4+ Altstadt Düsseldorf. Which neighborhood is the best one to stay at in Düsseldorf? Bilk, Düsseltal, and Derendorf are popular with other travelers visiting Düsseldorf. Which hotels in Düsseldorf are good for couples? These hotels in Düsseldorf are highly rated by couples: VIVA RIVERSIDE 4+ Altstadt Düsseldorf, Capella Breidenbacher Hof Düsseldorf, and Hotel-Villa Achenbach. Duesseldorf is the best city in the Western part of Germany. Duesseldorf is the best city in the Western part of Germany. Great for shopping, food, nightlife and it has a really great atmosphere. In my view it easily competes with Munich and it keeps getting better. Düsseldorf feels like it is on the move. Düsseldorf feels like it is on the move. Lots of construction, lots of development, especially in the old Haven area. The Hauptbahnhof is amazing, like a shopping mall that also has trains running through it. Felt very safe and well attended by everyone I dealt with. 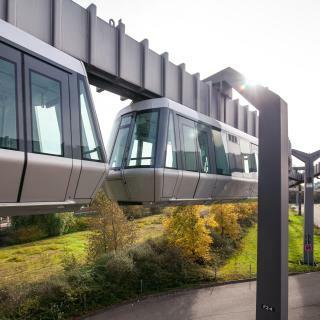 Superb, fast public transit with multiple options to most of the city and surroundings. Food was superb and inexpensive. Met several locals from all over the world - they chose Düsseldorf and I can see why. Inexpensive flights from DUS to anywhere, and you can easily get to Köln or Frankfurt if you need more options. Seriously, insufficient information on how to travel by public transport. It will be a tremendous help if more information on how to travel to places of interest be provided for free and easy travellers. Best food all around.-airport, Bahnhof, even in quiet neighborhood in Unterrath. Excellent public transportation system. Friendly people. Visitors must definitely take the double decker bus tour and in season, the river cruise. Flocksof sheep on the shores of the Rhine is a heartwarming sight within a great modern city. Düsseldorf is perfect for a weekend trip out of town. Düsseldorf is perfect for a weekend trip out of town. It isn’t great for families from what I experienced but good for a group of friends or a couple. 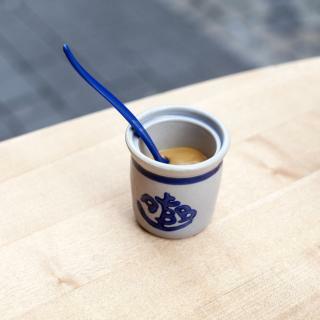 There is great shopping and some wonderful hidden gems when it comes to food. Overall, a good way to spend a few days away. Laura the receptionist was so friendly, gave suggestions for things to do around town and gave a run through of the hotel’s accommodations. You can rent bikes for free, get a battery pack so you can go right out if your phone is low from traveling. The room was BEAUTIFUL, boho feel, which is up my alley. I got a balcony that had a tub and lounge chair. The restaurant on the 16th floor has a great view of Düsseldorf and the breakfast buffet (with champagne) was good. Breakfast in the hotel is the best experience that you can have. They have all you need to keep strong during the whole day. In the other hand we had the train station next to the hotel, we got the train from the airport to the station and the other way. Dusseldorf city is beautiful and we would like to come back in a future, I will be an Ibis City guest again. Charming hotel in a great location for the Messe and Airport. I was staying on business with colleagues for the Düsseldorf boot show. It was a convient 15 minute walk to the messe and just 10/15 minute taxi to the airport. Rooms were simple but clean, and had a charm about them that you don’t get from the big chain hotels. 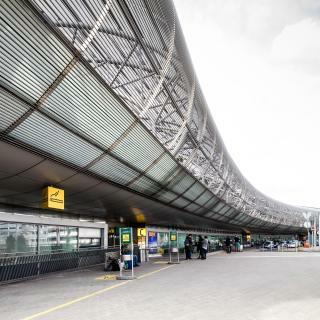 Great access to Airport and Düsseldorf Hbf. There is a supermarket near the hotel. And there are bus stops and Straßen-bahn stops and S-bahn stop and U-bahn stop！ The Room is very clean and Big TV. It is easy to find because it is a big sign. We can't speak English and Germany well, but it were very kind front desk staff. Two minutes walk from the U74 and U75 stations to get to Düsseldorf main city and Neuss. 13 minutes walk from coach stop to Weeze Airport. Reception staff speak English and German. Rooms are clean and warm. The lift is fast! Beautiful hotel. Worth the price. I'd come back. Great that they offer the apartments within the same hotel, not just rooms. Perfect for families. Good breakfast by European standards. Great that the tram stop that takes you everywhere is literally out the front door, especially since this is outside the city center. The bed was really comfortable and it was really clean. The TV had over 200 channels and the wifi worked great. The staff was really helpful and nice. For this price it was a great deal, we were 15 min walking distance from the city centre. Location and cleanliness .The hotel is is centrally located.About 5 mins walk for bus 721 to Airport,near to train station as well tram stops.About 2.5 kms from Altstadt/old town,main tourist spots for food and drinks in Düsseldorf. The location is very convenient of you need tombe near the Dusseldorf central train station. There is a REWE shop close to the hotel. The staff are very nice and polite people and always they want to help. Great location for access to the city centre (10min walk) and easy to get to from the Airport only 4stops on S-bahn. Very clean hotel and staff were really helpful and polite. It's located very close to the Central station as well as the city centre. Hotel is very clean with a decent breakfast. Everything was perfect. Nice, clean close to the city centre. Polite stuff, decent prices. Everything! Thank you Nikko Hotel and to all the staffs especially to one Filipina there (sorry i forgot her name..) Thank you for the wonderful experience. Location. Cleanness. Facility. almost everything.